To make sure that the classes represented by the training samples are distinguishable, their spectral characteristics need to be checked and compared. Use the Histograms window, the Scatterplots window, or the Statistics window to check the spectral characteristics of the training samples. Click the Training Sample Manager button on the Image Classification toolbar. The Training Sample Manager opens. In Training Sample Manager, choose one or more training samples to evaluate. In the dialog box, click the Histograms button to open the Histograms evaluation window. The Histograms tool works for integer images only. If the pixel values are stored as floating point, this button is unavailable. The histograms for the selected classes are displayed in the Histograms window. Examine the histograms for each class on all the bands available. Use the vertical scroll bar to show more graphs when more than four bands are available. The histograms of different classes should not overlap. If they do overlap, you need to remove or merge some of the classes. Follow the same procedure in steps 3 and 4, but instead, click on the Scatterplots button and the Statistics button to open their respective windows. Examine the scatterplots and statistics for different classes. They should not overlap with each other on all the band combinations. If you removed old training samples and created new ones, repeat steps 1 to 5 to evaluate the new training samples. This process is iterative and should be repeated until you are satisfied with the training sample set. 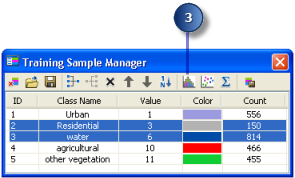 The color of the histogram or the scatterplot for a class matches the color of the class in Training Sample Manager. If a class is hidden in the background in the histograms or scatterplots, click the Change Order button at the bottom of the window to bring it to the foreground. In the Statistics window, you can copy the text to the Windows clipboard by pressing Ctrl+C.